In discussing Death as the Gift of Ilúvatar to Men, Tolkien once wrote that a "divine 'punishment' is also a divine 'gift' " (Letters, no. 210). While this subject and this statement are both of prime importance for understanding Tolkien, it is to an easily unnoticed aspect of his words here that I would draw attention. For Tolkien reveals an encompassing and unexpected vision of two sides of a critical subject. We may see him doing the same elsewhere, in obvious places, as when he shows both the beauty of courage on the Pelennor Fields and the horror of war in the Dead Marshes; or, more subtly, in Gandalf's hearty concession that Gollum deserves death, while nonetheless insisting that mercy be shown him because life and death are not equally in our power. I would argue that another subject of which Tolkien sees both sides is temptation. Say 'temptation' of course, and all our thoughts fly to the One Ring, and its gravitational drag on the character, good or bad, of the sentient beings of Middle-earth. We think of the times that Frodo offers the Ring to another, whether implicitly or explicitly. 'Do not tempt me!' Gandalf cries twice, alert with passion and the fear of his own pity (FR 1.ii.61). We think of Galadriel's bemused 'I do not deny that my heart has greatly desired to ask what you offer' (FR 2.vii. 365). We think of Strider's gentle 'It does not belong to either of us' when Frodo makes the connection between him, the Ring, and Isildur (FR 2.ii.247). And we smile at the fantasies of Gollum the Great and Samwise the Strong, no less grim for being more foolish (TT 4.ii.633; RK 6.i.901). With Faramir we sigh 'Alas for Boromir! It was too sore a trial!' (TT 4.v.681). And with Sam our hearts break when at the end of the quest Frodo fails. To hear him say 'The Ring is mine' (RK 6.iii.945) is both horrifying and inevitable. Already the Ring tempted him, gnawing at his will and reason. Wild fantasies arose in his mind; and he saw Samwise the Strong, Hero of the Age, striding with a flaming sword across the darkened land, and armies flocking to his call as he marched to the overthrow of Barad-dûr. And then all the clouds rolled away, and the white sun shone, and at his command the vale of Gorgoroth became a garden of flowers and trees and brought forth fruit. He had only to put on the Ring and claim it for his own, and all this could be. Now before considering the last of the uses of 'tempt' within The Lord of the Rings, it will be useful to note the two that are in the book, but not inside the tale proper. The first is in the Prologue, which of course purports to be written by someone within the same world but of a later time and who regards the events of the legendarium as historical. That writer tells us that Bilbo had been 'tempted to slay Gollum with his sword' in order to get away with the Ring and his life (FR Pr.12), but Bilbo's sudden pity for Gollum enables him to resist this temptation that would have made Bilbo no less a murderer than Gollum. And in the synopsis to The Return of the King we find the statement -- 'Faramir ... resisted the temptation to which Boromir had succumbed' -- and so again we see the usage clearly linked to the Ring. 'To me it seemed exceedingly strange,' said Boromir. 'Maybe it was only a test, and she thought to read our thoughts for her own good purpose; but almost I should have said that she was tempting us, and offering what she pretended to have the power to give. It need not be said that I refused to listen. The Men of Minas Tirith are true to their word.' But what he thought that the Lady had offered him Boromir did not tell. We can see here how, at least in Boromir's mind, testing and tempting are two faces of the same coin, differentiated by the good purpose of the one and the ill purpose of the other. Other evidence shows us that Tolkien himself saw testing and tempting as synonymous. Later in this same chapter, when Frodo freely offers Galadriel the Ring, she refuses it and all that accepting it would have entailed. Having done so, she famously comments: 'I pass the test' (FR 2.vii.365-66). In three separate letters, moreover, the only three which mention this moment, Tolkien refers to it each time as the 'temptation' of Galadriel (nos. 210, 246, and 297n.). We may also see in another letter in which Tolkien discussed the 'tests' that 'angelic' beings in the material world were liable to face experiences that he might have equally well have called 'temptations' (Letter no. 156). So the temptation to claim, or take, or use such power as the Ring offered is not itself the whole of temptation. There is more to it than that. Question IX - The meaning of the word "Temptation" and how we are tempted by God. As we can see here, the distinction in motivation that Boromir draws between 'testing' and 'tempting' resonates with the distinction drawn in the catechism between 'tempting' to 'learn the truth' or to try 'someone's worth', and 'tempting' 'to deceive and precipitate them into ruin'. Being suspicious of Galadriel to begin with because of ignorance, Boromir can hardly be blamed for being uncertain of her motives, even though Aragorn presently rebukes him when he openly suggests that she may be up to no good (FR 2.vi.359). The other members of the Company also felt that they had been tested whether by being offered something or by being asked a hypothetical question. This is true even though no one else seems to have doubted Galadriel's intentions. All of them, it seemed, had fared alike: each had felt that he was offered a choice between a shadow full of fear that lay ahead, and something that he greatly desired: clear before his mind it lay, and to get it he had only to turn aside from the road and leave the Quest and the war against Sauron to others. Boromir strode up and down, speaking ever more loudly; almost he seemed to have forgotten Frodo,while his talk dwelt on walls and weapons, and the mustering of men; and he drew plans for great alliances and glorious victories to be; and he cast down Mordor, and became himself a mighty king, benevolent and wise. Two things distinguish Sam's fantasy and Boromir's here. The first is quite obvious. Boromir's temptation fantasy stops with him defeating Mordor and becoming a great king. Sam's goes far beyond the mortal heroism of overthrowing Barad-dûr to embrace a perspective and powers that border on the divine. The second is that, the Ring already being in his possession, Sam just had to do 'claim it for his own, and all this could be' (emphasis mine). The scope of this vision, and the turn of phrase in that last sentence, should remind us of Satan's temptation of Jesus in the wilderness. (8) Again the Devil took him up into a very high mountain, and shewed him all the kingdoms of the world, and the glory of them, (9) and he said to him: all these I will give thee, if falling down thou wilt adore me. (5) And the Devil led him into a high mountain, and showed him all the kingdoms of the world in a moment of time; (6) And he said to him: To thee I will give all this power, and the glory of them; for they are delivered to me, and to whom I will, I give them. (7) If therefore thou wilt adore before me, all shall be thine. Now the texts of Matthew 4:1-11 and Luke 4:1-13 are quite similar throughout the entire 'temptation in the wilderness', but, more importantly, the word they both repeatedly use here, the word we traditionally render as 'tempt', is the Greek verb πειράζω. The Liddell-Scott-Jones Greek English Lexicon defines this verb as 'to try', 'to tempt', 'to put to the test' in senses both good and bad. This is the same word, for example, used to describe the attempts of the pharisees and others to test Jesus with questions about the law and other matters (Matt. 16:1, 22:35; cf. Luke 10:25). Greek expresses these two meanings, which English treats as overlapping, with a single word. Were we to consult the Latin New Testament, there we would also find a single verb, tempto, also defined as 'to try', 'to tempt', and 'to put to the test'. The close semantic kinship between 'test' and 'tempt' that we see here brings us back to Boromir's uncertainty in the scene in which, as Galadriel herself later admits (FR 2.vii.365), she was 'testing the heart[s]' of the Company. Yet we can now see this moment in a different light. For her role here is that of ὁ πειράζων (as Matt. 4:3 puts it), 'the one who tests' or 'tempts'. To meet an elf or fairy, especially a female, and find oneself tested is no strange thing for those who enter the woods of Faërie, which, like the biblical wilderness, is a place of tests and otherworldly encounters. Unlike the devil in the wilderness, however, Galadriel is not tempting the companions 'with a view to deceiv[ing] and precipitat[ing] them into ruin' -- to borrow the words of the Catechism quoted above -- but testing them 'for a good purpose, as when someone's worth is thus tried.' (Compare Boromir's 'for her own good purpose.'). Nor, despite the evocation of the Catechism and Hebrews 4:13 in Sam's feeling of nakedness, is she God who knows everything. As she herself concedes, she knows what will be only 'in part' (FR 2.vii.357). Galadriel thus plays in her own world -- that is to say, within the legendarium -- a role in between those played by God and the Devil in ours. This middle position is consistent with Tolkien's remarks in On Fairy-stories that the Road to Faërie is not the road to Heaven or to Hell (OFS para. 6), an idea with roots that go back beyond the ballad of Thomas the Rhymer, which he quotes, to The Romance and Prophecies of Thomas of Erceldoune. 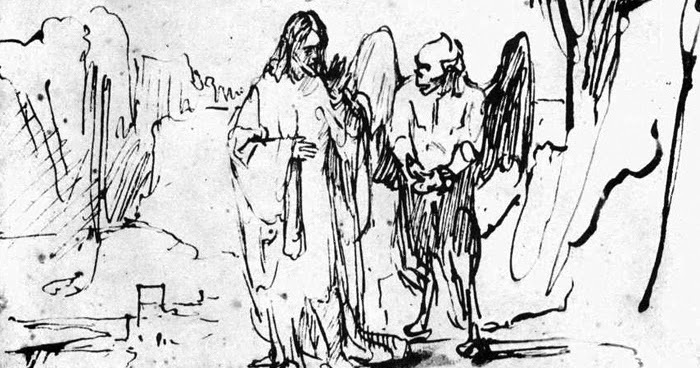 We may also see a kindred notion in the portrayal of the elves in The South English Legendary, as angels who fell to earth -- but not to Hell -- because they sought to remain neutral in Lucifer's rebellion. Exiles perhaps, like Galadriel and Gildor, but not the damned. On the other hand, Galadriel's role as 'tester' here is of far greater import than is common in medieval Romances, where the consequences of failing the test are serious, but personal. Sir Launfal, for example, temporarily loses the favor of his elven lady and is put on trial at Arthur's court, and Sir Gawain comes very close to losing his head to the Green Knight's axe. Galadriel's testing of the hearts of the Company, however, is intimately tied to the quest to destroy the Ring, the most dire matter in all of Middle-earth. We need only recall the famous lines with which she introduces her test: 'your Quest stands upon the edge of a knife. Stray but a little and it will fail, to the ruin of all. Yet hope remains while all the Company is true' (FR 2.vii.357). In its significance, therefore, her test is far more like the temptation of Christ in the wilderness, even if she and Satan had opposite purposes. But even now there is hope left. I will not give you counsel, saying do this, or do that. For not in doing or contriving, nor in choosing between this course and another, can I avail; but only in knowing what was and is, and in part also what shall be. But this I will say to you: your Quest stands upon the edge of a knife. Stray but a little and it will fail, to the ruin of all. Yet hope remains while all the Company is true. What matters most, is whether the members of the Company are true. Hers is a test of their character, or as Sam later puts it to Faramir, of their quality (TT 4.v.682). What she seems to offer them can be attained (if at all) only by proving themselves untrue. Thus, Boromir was not far wrong, grasping her means, but mistaking her ends. The way in which she frames her statement here, moreover, links its terms of hope, peril, help ('avail'), and knowledge intimately together and points directly ahead to her testing of their characters, the most important aspect of which seems to be what it told each of them about themselves. Sam's blushing, Merry's skittish reticence, Frodo and Gimli's blunt refusals to say anything, all suggest that they have seen something significant, while Boromir's boast of trustworthiness and his aspersions on Galadriel are the remarks of a man trying to defend himself from a thought he didn't like having. We must be careful in treating Boromir's testing here. There are two main dangers. The first is to read the text backwards from Boromir's attempt on the Ring, and, therefore, to oversimplify and obscure what is going on here. The second is to keep our understanding of the portrayal in the book separate from the very different portrayal in Peter Jackson's film. There, in keeping with Jackson's view of men as weak, we see a Boromir much more troubled from the beginning. He wrestles with the temptation of the Ring well before this moment. Frodo is aware of this, as is Galadriel who telepathically warns Frodo that Boromir will try to take the Ring. Now I watched Boromir and listened to him, from Rivendell all down the road – looking after my master, as you'll understand, and not meaning any harm to Boromir – and it's my opinion that in Lórien he first saw clearly what I guessed sooner: what he wanted. From the moment he first saw it he wanted the Enemy's Ring! But while Sam is excellent at guessing Frodo's mind (FR 2.x.403, 405-06; TT 3.i.419), he is no oracle when it comes to others', especially when he is 'looking after his master' as he admits he was doing with Boromir. He is not always entirely right (or wrong), and when speaking to Faramir he does not know his brother's whole story. To take two outstanding examples, Sam long entertained doubts about Strider, even beyond Weathertop, so much so that Frodo is able to say -- not without some humor -- that Sam 'never quite trusted' Strider until Glorfindel came along (FR 2.i.220). It is also in his zeal to protect his master that he spoils Gollum's best and perhaps only chance at repentance (TT 4.viii.714-16). In the case of Aragorn, he is flat out wrong; in the case of Gollum he mistakes him, critically, in what one could argue was the moment he most needed to get him right. By contrast Galadriel, whatever precisely passed between her and Boromir, did not think it worth mentioning to anyone in the Company as far as we can tell; and when she later speaks to the returned Gandalf she, evidently, expresses her concern in such a way that she seems at least as anxious for him as she may be about him. And Gandalf sees it the same way: 'Galadriel told me that he was in peril. But he escaped in the end. I am glad. It was not in vain that the young hobbits came with us, if only for Boromir's sake' (TT 3.v.496). It would be hard to see what Galadriel meant by 'avail', if, as a result of her testing him, she knew that Boromir would try to take the Ring and said nothing. This concern that he was in peril is thus quite revealing. It indicates that her testing of their hearts had to do with the members of the Company being the right people in the right place at the right time. As long as they are all true, hope remains. That she says nothing to any of them about what she learned shows that she tested them for their own sake, so that they would know what they needed to know about themselves in order to go on. When Frodo later inadvertently turns the tables on Galadriel and tests her heart by freely offering her the Ring, he allows her to face the test of character she had set them, but in a far more real and dangerous way. For Frodo has the power to grant her desire. But Galadriel is true even when she is in peril. She passes the test. And so hope remains. Torn between his fear for Gondor and the power the Ring seems to offer, Boromir falls, but not beyond redemption. He 'escapes', as Gandalf says. 'Few have gained such a victory', declares Aragorn (TT 3.i.414), who seems unlikely to lie to a dying comrade: they are not speaking of his battle with the Orcs, who defeated him, but of his struggle with the Ring. But how does he escape his peril? To be sure his failure to seize the Ring is essential, but not decisive on its own. Losing the Ring to Bilbo did not save Gollum. Yet it made his redemption possible. gasped, stared for a moment amazed, and then ran wildly about, seeking here and there among the rocks and trees. 'Miserable trickster!' he shouted. 'Let me get my hands on you! Now I see your mind. You will take the Ring to Sauron and sell us all. You have only waited your chance to leave us in the lurch. Curse you and all halflings to death and darkness!' Then, catching his foot on a stone, he fell sprawling and lay upon his face. For a while he was as still as if his own curse had struck him down; then suddenly he wept. Note the hint at something more than random 'chance' in the narrator's suggestion that it was 'as if his own curse had struck him down'. Note, too, the parallel to Bilbo's behavior at Rivendell, where Bilbo, having asked Frodo if he might 'see [the Ring] for just a moment', 'to peep at it again', then reaches for it instead. Seeing Frodo's strong, almost violent reaction, Bilbo 'passed his hand across his eyes. "I understand now", he said. "Put it away" ' (FR 2.i.232). Boromir, too, understands now. Like Galadriel (FR 2.vii.366), and like Gandalf before her (FR 1.ii.61), he has seen the possibilities the Ring offers him, and the consequences. How far the knowledge he gains from Galadriel's test has brought him, aided now by his 'fortunate fall', is summed up in the transition he makes from imagining himself transformed by the Ring into 'a mighty king, benevolent and wise' (FR 2.x.398) to seeing the madness of this vision for what it is (2.x.400), confessing his error, and begging the true king to save his homeland (TT 3.i.414). If the visit to the Faërie of Bombadil prepared the hobbits to encounter a world that is larger -- in more than one sense of the word -- than the world to which they are accustomed, the visit to the Faërie of Galadriel turns the attention of the Company momentarily inward, to the field where the inner battle against the evil of the Ring must be fought even as the outer quest enters its decisive phase. That it does so finds another interesting parallel in the gospel, since it is after Jesus faced his tests in the Wilderness that he began his ministry in earnest. And just as the temptations of Christ range from the mundane (bread) to the grandiose (power), so, too, do the tests of the Company, from Sam and Merry's hole with a bit of garden to Boromir's visions of using the Ring to defeat Sauron, tests which are recapitulated on a grander and darker scale with Sam, Frodo, and Galadriel in the latter half of the chapter. What Tolkien has done in The Mirror of Galadriel is to re-frame the testing that visitors to Faërie often encounter in a far more serious way. Galadriel does not test the Company merely for the sake of testing them, but neither does she seek to seduce and ruin them. Her testing of them stands upon the same knife edge as the Quest does, and as she herself does. In the understanding of testing and temptation found in the Catechism and the Gospel, and in the parallel between forests in fairy-stories and the wilderness in the Bible, Tolkien discovers a means and a stage that suit the high tone of his tale. And if we recall that he regards the story of Christ as the fairy story that came true (OFS para. 104-05), it only makes sense that he would find that it suits his 'own good purpose'. *The biblical citations presented as footnotes in the Catechism I have converted into inline citations for the sake of ease and clarity. **The translation is the Douay-Rheims of 1899, a Catholic version, which Tolkien would have been familiar with. Why [the Istari] should take [a human] form is bound up with the 'mythology' of the 'angelic' Powers of the world of this fable. At this point in the fabulous history the purpose was precisely to limit and hinder their exhibition of 'power' on the physical plane, and so that they should do what they were primarily sent for: train, advise, instruct, arouse the hearts and minds of those threatened by Sauron to a resistance with their own strengths; and not just to do the job for them. They thus appeared as 'old' sage figures. But in this 'mythology' all the 'angelic' powers concerned with this world were capable of many degrees of error and failing between the absolute Satanic rebellion and evil of Morgoth and his satellite Sauron, and the fainéance of some of the other higher powers or 'gods'. The 'wizards' were not exempt, indeed being incarnate were more likely to stray, or err. Gandalf alone fully passes the tests, on a moral plane anyway (he makes mistakes of judgement). For in his condition it was for him a sacrifice to perish on the Bridge in defence of his companions, less perhaps than for a mortal Man or Hobbit, since he had a far greater inner power than they; but also more, since it was a humbling and abnegation of himself in conformity to 'the Rules': for all he could know at that moment he was the only person who could direct the resistance to Sauron successfully, and all his mission was vain. He was handing over to the Authority that ordained the Rules, and giving up personal hope of success. πειράζω occurs in various forms in each text. We also find the noun πειρασμός and ἐκπειράζω, an intensive form of the verb. Matthew: πειρασθῆναι -- 'to be tempted' (4:1); πειράζων -- 'one who tempts', (4:3); (Οὐκ) ἐκπειράσεις -- 'thou shalt (not) tempt' (4:7). Luke: πειραζόμενος -- 'being tempted' (4:2); (Οὐκ) ἐκπειράσεις -- 'thou shalt (not) tempt' (4.:12); πειρασμὸν -- 'temptation' (4:13). 'Try' in the definition of course means 'test' -- as in 'you're trying my patience'. 'Try' as in 'try to' is a related, but separate verb. My pedantry gene requires me to concede that, since Galadriel is female, we should have ἡ πειράζουσα instead of ὁ πειράζων. It may be that the thought of other, similar encounters with Galadriel lies at the back of the suspicions of her 'nets' and 'deceptions' we discover among the Rohirrim: TT 3.ii.432; vi.514. TT 4.viii.714-15. See Tolkien, Letters, no. 246. At the moment in question Sam has ample reason to mistrust Gollum and to believe him dangerous. As is often the case in The Lord of the Rings, however, the course that reason dictates is not the correct one. Gandalf, for one, believed that both Saruman and Gollum, whose deeds were far worse than Boromir's, could be redeemed (FR 1.ii.59; TT 3.x.577, 583-84). According to Of the Rings of Power and the Third Age even Sauron was once not beyond redemption, if he had sincerely repented (Silmarillion, 285). In The Hunt for the Ring Christopher Tolkien writes of a version in which Saruman considers repentance (UT 346). This interpretation of Aragorn's words to Boromir I owe to Corey Olsen. Compare also the powerful scene in The Tower of Cirith Ungol (RK6.i.911-12), where passing visions of the Ring cause Frodo to see Sam as an orc. By this turn of phrase I am not suggesting that there is more than one Faërie, only that Faërie has different aspects in different places. So Boromir might have succumbed to the Ring-lust, had Galadriel not tempted him? That is a fascinating thought. Almost like a vaccination. It is an interesting thought, that whatever she says to him in the end helps him. Given her own thoughts and struggles when it comes to the desire for the Ring, and her own desire to preserve and defend what was, it could have been a very interesting exchange. She would have been ideally placed to understand the peril he was in. As for pedantry, I'll try to include more languages next time. I have lots of thoughts about this post, but to confine attention for the moment to Boromir: I'm not convinced by what I take to be the argument of the post, namely that (as Joe says) Galadriel's test saves Boromir from falling. This, as you say, is the direct opposite of what Sam says, namely that it was through Galadriel that Boromir first realized what he wanted. Just for starters, the notion that 'Boromir stumbles, but does not fall' seems wrong. He does try to take the Ring (Jackson did not invent that) and Frodo very soon after deems that Boromir has fallen into evil. He falls, simple. That his fall is not irredeemable is simply to say that, by Tolkien's lights, all sinners may repent - but there is still sin, and Boromir sins. More interesting (if ultimately related) is the argument between Hillman and Gamgee. On the face of it, the position of Samwise is far more credible: Galadriel showed Boromir a mirror of himself in which he saw the truth that he had been hiding from. And it seems only common sense psychology to infer that once he had seen his temptation, as it were face to face, the desire grew ever stronger. To argue that Galadriel gave Boromir self-knowledge that allowed him to overcome this desire seems to require too much interventionist intent from Galadriel. Her whole deal, as your quotes show, is simply to show what is, not to intervene. What she shows is that Boromir is in peril: his desire for the Ring is strong and may (note the conditional, Galadriel does not know all the future) lead him to fall. And it does. And he falls. That he then trips over and literally falls, or that Frodo puts on the Ring and disappears from the sight of Boromir, might be a providential means for Boromir not to fall completely, as we must assume he would have had he taken the Ring into his possession; but it has nothing to do with the encounter between Boromir and Galadriel - if Boromir is saved it is due to providential 'chance' and not to Galadriel's test. Well, Simon, if you take that to be the argument of the post I have clearly done a poor job. Perhaps you are right, though, about Boromir falling/not falling. Perhaps I have overstated my case on that point and need to revise it. But I don't agree that Sam is entirely right. Nor is he entirely wrong. He has also overstated his case. There are two moments in the Council in which, especially if read backwards, could be taken to suggest the desire of which Sam speaks. The first is when Borormir sees the Ring and there is a glint in his eye. The second is when he asks why they can't use the Ring, and then 'doubtfully' agrees with Elrond's explanation, and says 'So be it.' I have little doubt that the words 'so be it' are what Boromir is referring to when he speaks of the men of Gondor being true to their word. It's interesting to think of the struggle Boromir goes through after the test in the light of Gimli and Elrond's exchange of lore on the efficacy of sworn words. The tension between the positions of their gnomic expressions is fought out within Boromir. Yet all of Boromir's subsequent words and behavior until after the test (I've just gone through them all this morning) show not a hint of any desire for the Ring. He accedes to Elrond's wisdom which he has already conceded. And the question he asks is not unreasonable, especially coming from someone who knows little about the Ring and whose people are on the front line of the war. It would be much stranger if no one asked it. The glint in his eye I cannot explain, except perhaps to say that everyone feels the pull of the Ring. If Gandalf and Galadriel feel it, why should we think it's anything special if Boromir feels it as well? Galadriel does speak of 'availing', which clearly means 'help' or 'be of use'. If the 'help' she offers here does not come in the form of self-knowledge for all the members of the Company, it is hard to know what other form it does come in. i have also been thinking of Boromir's 'fortunate fall', which I will gladly conceive is the work of 'chance', but let me offer this in response. The work of 'chance' per se does not save him. Rather it gives him a moment in which the self-knowledge he gains from the test, and which is proven by his struggle since then, allows him to see what he has done for what it is, and to pull himself back. Anyway, one other piece of evidence, again not conclusive. In his talk with Frodo when he asks for the Ring, Boromir says of Gandalf and Elrond: 'Yet often I doubt if they are wise and not merely timid.' -- The "often" seems (it could be denied) to point to a long-running internal dialogue that Boromir has had ever since the Council, which in turn points to the Ring being at work on his desires from his first glimpse of it. I cannot say you are wrong about 'often'. And yet -- ;-) -- 'often' describes frequency, not duration. If Boromir had doubt as little as once a day once every other day from the moment of the test (17 January) until the moment he says 'often' (26 February), that would certainly count as often. I would tend to place the 'often' with the rest of the evidence that points to him actively thinking about using the Ring. But I cannot see how that helps you. Because if the 'often' is from the moment of the test that just pushes us to Gamgee's point - that Galadriel awoke a gnawing beast within Boromir's breast. Now I feel doubly uncomfortable: the continuing feeling I am missing something important and now a guilt that I am keeping you from Sir Orfeo. Simon, if you look, you will notice that I have made some changes reflecting our discussion of Boromir's fall. My thanks for your input. It is always thoughtful and well received, even if we don't agree about the accuracy of Sam's history of Boromir's desire for the Ring. Perhaps one day I will pass my hand across my eyes and say "What have I done? A madness took me." But today is not that day. Debating about their future path on their last night in Lorien, Boromir gives himself away with his "folly to throw away" and Frodo notices: he "caught something new and strange in Boromir's glance". And Frodo notes that Boromir had said something similar at the Council but had then accepted the correction of Elrond. This seems to me to establish: (i) that something awakes in Boromir after his encounter with Galadriel, and (ii) that something is not entirely new, for it echoes what he said on first seeing the Ring. I also add what to me is a fundamental point: Galadriel's silent questioning of the company is no less (and actually far more) of a mirror than her Mirror - that is, Galadriel sees and in doing so shows to them the heart of others. Sam seems to put it precisely: Galadriel showed Boromir clearly what was already in his heart. But in seeing himself she also changed Boromir. So I actually think that without Galadriel's intervention Boromir might not have tried to take the Ring. However, I am open to the suggestion that this self-knowledge helped him as well when it came to the crunch, that without it he would not have seen what he had done so quickly, nor repented so soon. Simon, I would like to invite you to write a guest post on this issue, which I will publish without comment. Tom, thanks. But what would be the point of writing a guest post that has no comment from Tom Hillman?!? Also, I'm not sure that I have anything more to say than what I have written above. And perhaps most importantly, I'm still concerned that I have missed a key element of your original post and so don't feel comfortable as yet addressing this issue in a post. I'd like to hear your thoughts on the issue of the proximity of the ring. When it is close, it exerts an evil influence; when it is at a distance, then someone not evil can come to his senses. I bring this up since the idea that a thing can be in itself evil, or--similarly--a place can be evil, or tainted with evil, is so very out of court with our modern point of view. But it is clearly very important to this discussion. Gandalf's reference to the hobbits I think indicates particularly Merry and Pippin, in which case Boromir is redeemed through atonement, don't you think? Very brilliant discussion. I can think of several other fortunate falls in the novel, not least the conclusion. You're right the Ring is evil, but it's evil because Sauron put so much of his power into it. I think of it like gravity. It pulls on anyone near it, and like gravity the greater the thing or person it's close to, the greater the pull. If we think of the times that we hear people talk or think about the way the Ring "tempts" them, it is in a way not unlike what Boromir says Galadriel was doing. It mirrors their desires. Not consciously. I don't mean I think the Ring is sentient, but that seems to be the effect it has. I think the Ring has no power of Bombadil because Bombadil wants nothing. Presumably Galadriel's ability to test the company stems from her ring, which is also an instrument of power. So your discussion of Tolkien's double sense of "tempt" helps us recognize the saving difference between these two rings. Thank you for your elaboration--it is much appreciated. Thank you very much, Helen. I am glad you like it. The Defense of the Homburg -- Wait, What?